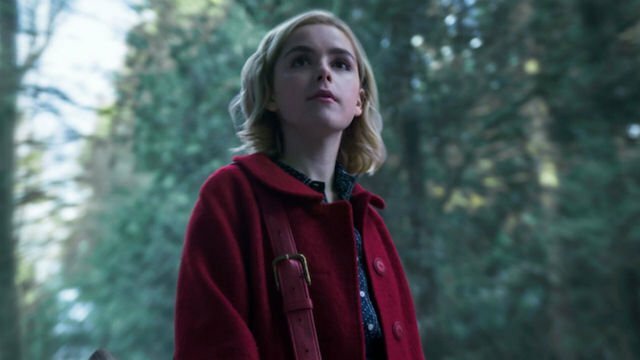 Only a few hours remain until Chilling Adventures of Sabrina premieres on Netflix. As a last-minute promotional strategy, the streaming service has graced us with the series’ most ringing endorsement yet. Four key cast members from Sabrina Spellman’s last live-action outing have reunited to pass the torch to their successors. You can check out what they had to say below. Melissa Joan Hart (Sabrina), Nate Richert (Harvey Kinkle), Caroline Rhea (Hilda), and Beth Broderick (Zelda) were all series regulars on Sabrina the Teenage Witch. The show aired for seven seasons on ABC from 1996-2003 and was a major staple of the network’s TGIF lineup. Unlike the new version, the older series adopted a sitcom format and was geared toward a mainstream teen audience. To drive this point home, the show featured guest appearances from the likes of Britney Spears and Phantom Planet. Though the series are markedly different in tone, it’s actually touching to see the original actors co-sign the reboot and personally salute the actors replacing them. Rhea and Broderick also sent “best witches” to the new Hilda and Zelda, played by Lucy Davis and Miranda Otto, respectively. Rhea’s bit was noteworthy because apparently, “now [she] gets to be Etta Candy.” Her remarks reference Davis’ role as Etta Candy in the Wonder Woman film. However, it’s not clear if she’s talking about plans for a Halloween costume or if she’ll actually be playing the role in a professional capacity. The first season of Chilling Adventures of Sabrina will be available on Netflix starting at midnight. What do you make of the actors’ remarks? Let us know in the comment section below!